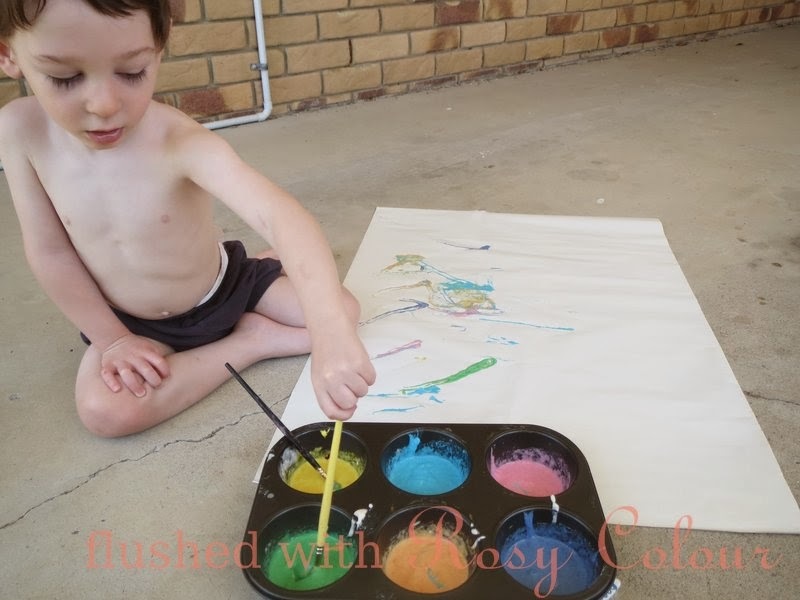 I haven't been blogging much lately because I've been 'under the weather', but this painting activity with my 2 year old son is just what I needed to improve my mood! 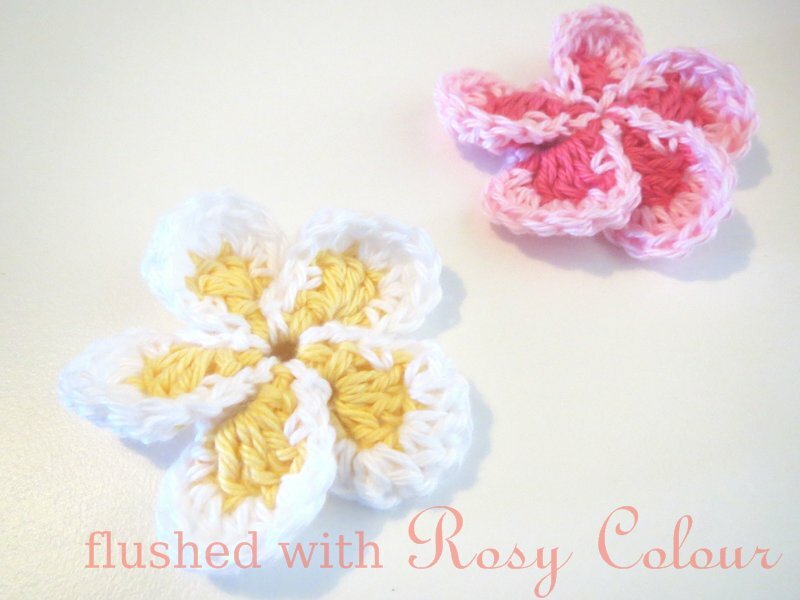 There's nothing quite like a mix of pretty colours and an excited toddler to lift the spirits. 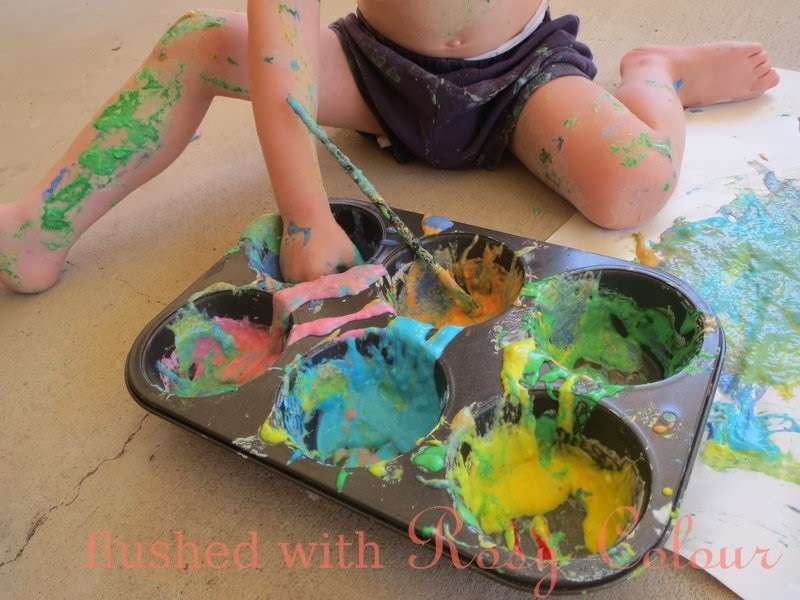 I found the recipe at Crunchy Farm Baby, its basically flour, water and food colouring. I've been researching activities to do with my son as I've decided that's the most worthwhile thing I could be doing with myself right now, but I've got to tell you its exhausting watching all the mummy bloggers out there post about all the wonderful things they do! It can feel quite daunting when I realise there's so much more I could be doing for my son. 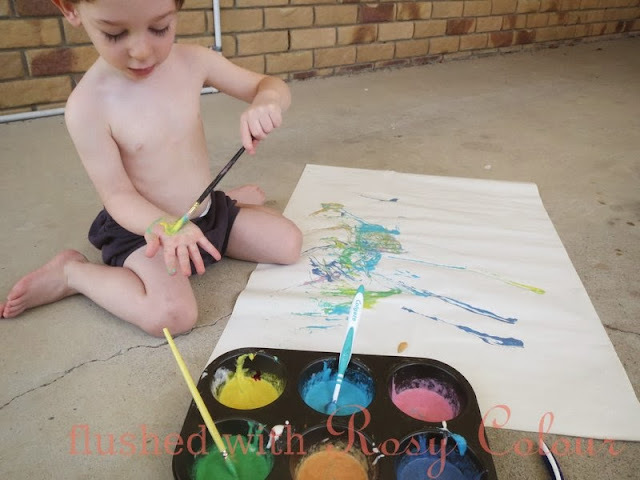 I tend to stay away from messy activities, but this one wasn't too difficult, its just food colouring so was easy to clean up. I really like how the colours turned out, because its just flour, they had a nice pastel shade to them. I just made blue, yellow, pink, purple, orange and green. Thomas knows pink and purple, and can say 'geen' and 'boo', but still doesn't know orange and yellow. 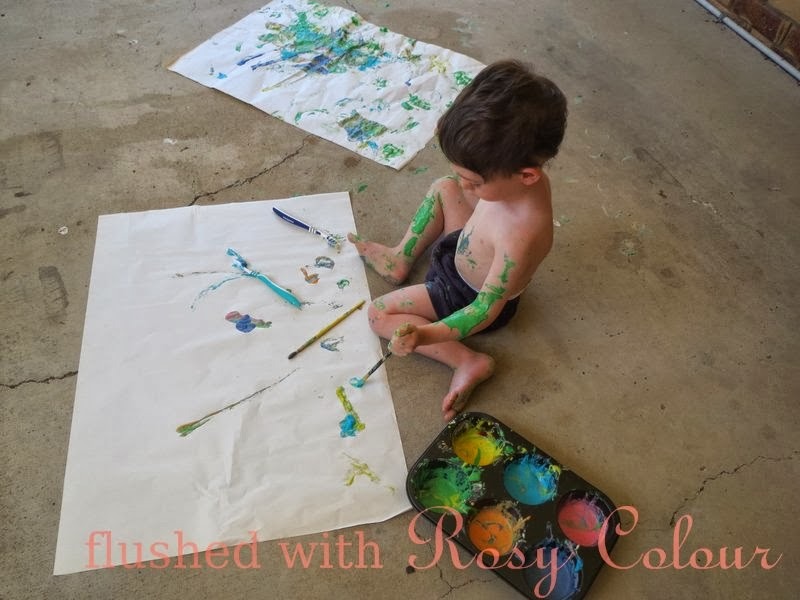 He loved painting, he soon starting painting his hands and printing them on the paper, then his feet and printing them too. 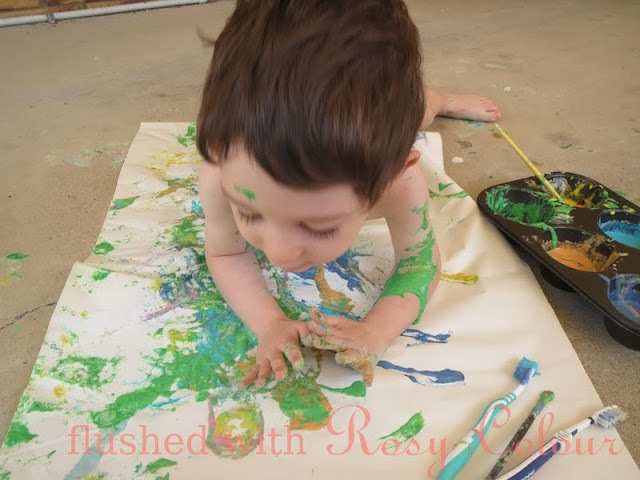 He even started painting his tummy then abruptly lay down on the paper face down to print his tummy! He proceeded to paint his legs and arms as well. He finished by scooping the goopy paint up in his hands and smearing it onto the paper. I'm assuming I can skip today's play-dough activity because this really turned into a sensory activity by the end. 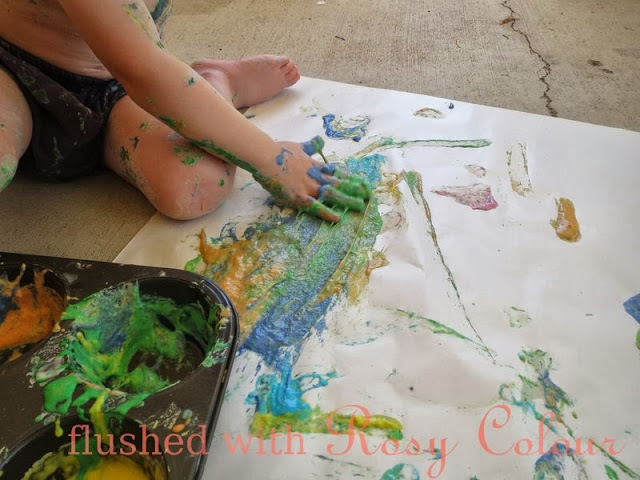 The texture of the goopy paint oozing through his fingers was very tactile and an excellent sensory activity. printing hands, feet and tummy too!